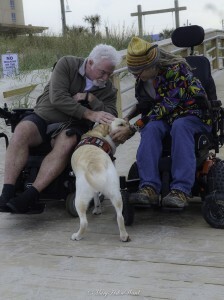 Zipping down the Carolina Beach boardwalk in his wheelchair with a woman on his lap – a cheerful jacket and hat, dreadlocks, and a smile that welcomes the world. Instant friends with everyone he meets. “Love ya” is a phrase he uses often. A man dressed in black and tan with short gray hair, his wife sitting on a bench by him and his service dog. Serious. Chally is crazy about his family. He says Beth is “is a caring loving considerate caregiver and partner..and a great cook!” Spend a few minutes with them and one can clearly see why he feels that way. His grandkids? He is a walking photo album of them, literally. He has their faces tattooed on his body! Beth and I talked about the challenges of caregiving. We walked a bit on the beach but not too far from our husbands. We laughed some, we hugged, we talked about our families, and we shared some of the fears we had of the future. Our husbands went as far as the boardwalk would take them in their chairs. I don’t know what they talked about but it looked like from a distance that they have known each other forever. Others saw two men confined to wheelchairs with a dog between. Beth and I saw our Marines, as tough as they come, with a service dog loving them both at the same time. The four of us couldn’t be more different in personality, and style, yet we are the same. We walk the same walk with this disease. We didn’t stop talking until we each got in our vans. The men pulled in to the van in their wheelchairs and the women got in the drivers seat. Chally was diagnosed in February 2015. 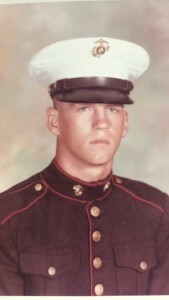 He was in the infantry, and served in the United States Marine Corps from 1968-1969. He is a veteran of the Vietnam War, a Purple Heart recipient, having been wounded not too long after his boots landed on the ground. His enemy now is ALS. He battles it every day, 24 hours a day. He wouldn’t mind it one bit if a cure was found soon!